EQxD Recap #AIACon16 - "PhilAIAdelphia Architect Ninja Warriors"
This year's AIA National Convention in Philadelphia was memorable in so many ways and inspired us to IMAGINE the future of Architecture with new energy, new ways of approaching challenges and taking action to improve our profession. Philadelphia holds a dear place in my heart; my first city after graduating from Architecture School, my first job, first apartment, and the place I developed my voice and professional identity. And last year, I was fortunate to participate in TEDxPhiladelphia "And Justice for All" in 2015, where I shared my TEDx talk "Why Equity in Architecture Matters" to an audience of 1200 about the value of architecture in our daily lives. PhilAIAdelphia Ninja Warriors - "Architect Style"
Not sure if everyone had a full convention itinerary, but given the amount of choices provided for convention programs, tours, expo floor activities and related networking events, the whole week felt like the architect's version of American Ninja Warriors. While I was really excited that Philadelphia is such a walkable city with the Convention Center located in the heart of a thriving urban center, (which meant less time commute time between convention activities, hotel, tours and networking events) getting to the right place at the right time required both mental focus and physical stamina. In some cases there was added complexity of events overlapping or completely being double booked. In the course of week, I am sure that I (and many of you) clocked more than 10,000 steps. But even with the busy hectic pace (as in life), sometimes you have to remember to slow down, stop and take a look around. Some of the most memorable moments at convention occurred during those intentional pauses. Julia Louis Dreyfus, Neri Oxman and Rem Koolhaas resulted in a trifecta of Keynotes about Innovators, Disrupters, and Risk Takers. While one could say that Julia Louis Dreyfus interview with Terry Gross had nothing to do with Architecture, there were compelling life lessons in her stories about career progression that struck a chord about having conviction to drive a meaningful career by taking risks and finding your own voice. 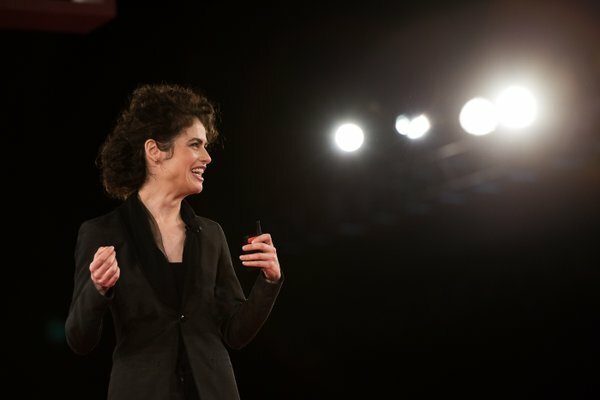 Neri Oxman's talk on how "Biology Is Key To Unlocking The Future Of Design" was captivating. There was a lot of positive feedback from attendees that had mentioned their brains had been "stretched, twisted and stretched some more." And finally Rem Koolhaas' conversation with Mohsen Mostafavi on how "Architecture has a serious problem today in that people who are not alike don't communicate." Rem continued is role as provocateur in postulating that Architecture's greatest value in the future may not even be architecture given the rapid disruption of technology and advancements in fabrication and Silicon Valley's influence on business. In line with the keynote speakers' spirit of innovation, disruption and risk taking, EQxD hosted the 2nd Hackathon pre-convention workshop following its debut last year in Atlanta. Channeling the spirit and tech mindset of "hacking" from Silicon Valley WE315 EQxDHackathon - Architecture And the Era of Connections asked the participants to leverage design thinking skills to define a challenge in architecture practice and propose a solution. In the next 2 weeks, we will be featuring our post-hack blog series with contributions from our panelists, our jurors and each of teams "elevator pitch" of their business plans. You can get a sense of the event from the "Storify" recap so you can view the top tweets from the event. Wanda Lau of ARCHITECT Magazine also provides a great summary of the event. Notably, we had TEDxPhiladelphia Alumni and Tech Entrepreneurs lead an invigorating panel discussion on the the experience of taking risks in forging new paths. 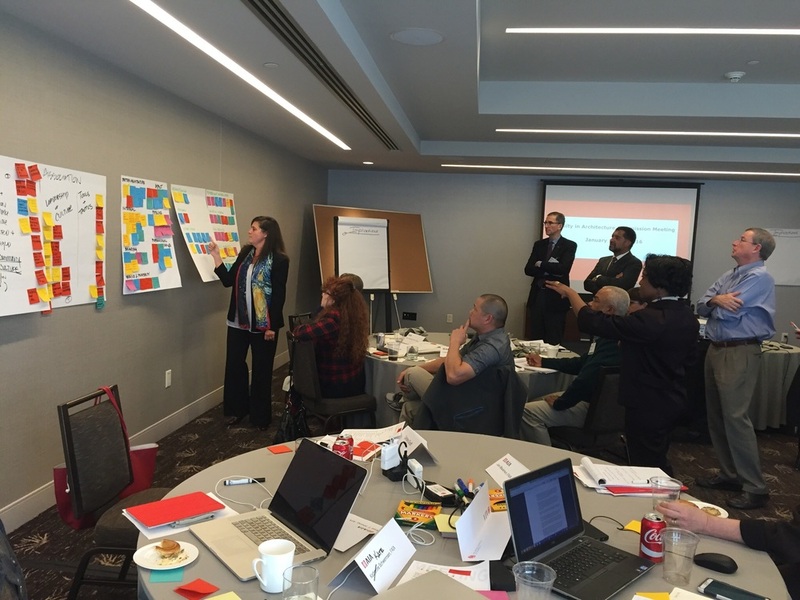 Based on a discussion at AIA Women's Leadership Summit in Seattle regarding the general lack of AIA Convention seminars on equitable practice and low representation women and people of color on panels, we had encouraged groups around the nation to submit seminars for consideration. Out of 11 proposals, 7 were selected and many of them had high attendee counts between 100 to 200. The AIA National Diversity and Inclusion Council launched a new initiative to spread awareness about equitable practice issues in architecture with a game that plays similar to Jeopardy, the TV trivia game show. The game is meant to be a fun way to start the conversation about equity, diversity, inclusion in the workplace while also giving colleagues an opportunity to understand that the words we use may have different meanings to others depending on their background. The game was introduced at the Town Hall convention booth with visitors of all walks interested in getting a copy to share. The council will further develop the game based on feedback and provide a distributable version in the near future. And finally, we were witnesses to the most auspicious occasion of the convention - the celebration of dynamic duo Robert & Denise for their lifetime contributions to the Institute, Architecture and Urban Planning. They were also the first pair to receive recognition of the true collaborative spirit of the profession; which has been long perceived and awarded as an individual's lone achievement of creative expression and execution in the built environment. Personally, I can't help but think of Denise as the embodiment of Melinda Mae from the Shel Silverstein poem who ate her whale! Well there is certainly more than enough whale to go around, so let's all commit to grabbing our forks and getting others to come to the table so it doesn't take another 89 years to attain our goals. We can't wait to connect with all our EQxD Champions this week in Philadelphia! There is so much to see and do, but there are definitely things that you won't want to miss. Let this post be a guide to the events with a lens for Equity, Diversity & Inclusion and the people that champion Equity in Architecture. As the mastermind behind iconic characters Elaine Benes (from the NBC hit series Seinfeld) and Selina Meyer (from the HBO series Veep, now in its fifth season), Julia Louis-Dreyfus has been riveting audiences with portrayals that upend the stereotypes over her impressive 30+ year career. In her personal life, Julia is a social activist who is passionate about climate change, water conservation, children’s education, and the power of design. Important topics that we connect with, too. Interviewing Julia is Terry Gross. Equitable Practice Seminars - Various Times & Locations. You won't want to miss these seminars that have been put together by architects who are leaders in the topic of equitable practice. In past year's conventions, many noticed that there were a lack of these types of seminars. In 2016, there are at least 7, including those put together by Amy Kalar, Ann Sobiech Munson, Lilian Asperin Clyman, Nicole Martineau and Nicole Dress. You can't solve the problem of inequity, unless you can openly discuss the root of the challenges vs. just being fixated on the symptoms. Come visit us for fun, games and learning your lexicon of terms and tools. Meaning conversations about the difference between Equity, Equality, Diversity, Inclusion, etc. will get you in the right mindset to tackle these challenging issues in our profession in an approachable and relatable way. AIA Diversity & Inclusion Council 2016 - R to L (Front to back) - Marcia Calloway, Rosa T. Sheng, AIA, Jeff Ostrander, Renee Kemp-Rotan, AIA, Linsey Graff, Associate AIA, Lisa Chronister, AIA, Greg Burke, AIA, Lori Garrett, AIA, Tania Salgado, AIA, Brent Castro, Associate AIA, Bryan C. Lee Jr. Associate AIA, Yu Ngok Lo, AIA, Bill Bates, FAIA, and Damon Leverett, AIA. Recognizing Women as Architects, Not Female Architects panel discussion w/ Wanda Lau of ARCHITECT Magazine moderating. The movement to promote equitable practices in the architecture profession is at long last building momentum and excitement. Jill Lerner, FAIA, will discuss how she led the initiative to update the rules for AIA Gold Medal as AIA NY president in her successful nomination of Robert Venturi, FAIA, and Denise Scott Brown, Hon. FAIA. Rosa Sheng, AIA, will discuss her work with AIA San Francisco’s Equity by Design Committee and the AIA’s Commission on Equity in Architecture. Joan Blumenfeld, FAIA, will discuss the ongoing efforts and programs offered by the Beverly Willis Architecture Foundation. Slought and the Architecture Lobby are pleased to announce the premiere of(Re)Working Architecture, a video documenting a performance event organized by the Architecture Lobby with scenes, real and absurd, of architectural practice, on Friday, May 20, 2016 at 6:30pm. The unveiling of the film will be followed by a panel discussion addressing both architecture's lack of labor consciousness and its ability to learn from art activism. If you are going to AIA National Convention in Philadelphia, May 18-21st this year, be sure to join in on one or more of the seven workshops in our Equitable Practice curated collection. Please note that all but WE315 are included with your general registration to convention. 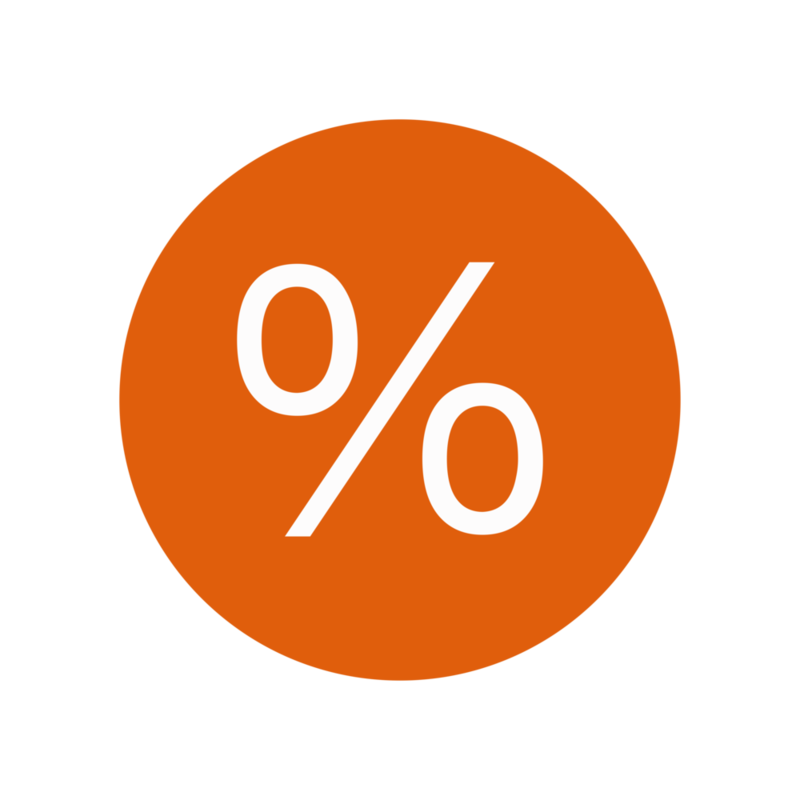 The Hackathon is a preconvention half day workshop on Wednesday and requires additional registration fees. Register Here. The theme of TEDxPhiladelphia 2015 was centered around the final four words from The Pledge of Allegiance: “And Justice For All”. The full day program of 4 sessions explored the presence of universal concepts in our communities including access, fairness, opportunity and democracy; and purposefully acknowledged lessons learned and questions raised in their absence. Out of 400 applicants, I was privileged to be among the 14 speakers on Thursday, June 11, 2015 at Temple Performing Arts Center. We came from diverse professions and backgrounds; entrepreneurs, business leaders, a child advocate, a professional protestor, a scientist, an artist, an educator, a lawyer, a police commissioner, a journalist, a Pastor, and an Architect. From the beginning to the end, the TEDxPhiladelphia organizers were nothing short of amazing supporters and professionals; most of whom have volunteered their time and effort to make this event the great success that it was. Special thanks goes to Emaleigh Doley, Michelle Freeman, and Marcia McInnes for asking me to be part of this provocative and engaging event. The following is an excerpt of what I intended to say, that didn't fully get into the final talk. I had worked on this "speech" for the last several months and planned to memorize the talk in its entirety and deliver it with great finesse and polish (Just like those TED videos I keep watching). Well, during the dress rehearsal, to my chagrin, I realized that I had written more than I could adequately deliver in the 18 minute time slot allocated for each of the TEDx speakers. So rather than panic about getting everything "perfect", I gave myself liberty to speak from the heart. If I forgot some of the key words or thoughts I wanted to convey, I reassured myself that I could always share them here. I believe that made all the difference in my ability to calm my nerves before I stepped out to speak to the audience of 1100. So, Why should you care about Equity in Architecture? and Why does Architecture matter in the first place? Equity is not just an issue in Architecture. And it’s not just about getting equal representation in gender or racial diversity. Equity is about asking WHO can bring new ideas to solving difficult challenges? And WHO adds a different yet compelling viewpoint to the conversation. It's about noticing WHO’s missing at the table? And asking those people to join in. Equity is about conscious inclusion; recognizing and giving people fair access to opportunities and resources they need, so that we can ALL achieve the American dream; Life, liberty and the pursuit of happiness. And Architecture is not just for Architects. And It’s not just for the 2% of the population who currently hires them. Architecture is for everyone. According to the EPA, We spend nearly 90% of our time INSIDE of buildings and the impact of the built environment has a lasting effect on how we work, how we learn, our health, safety and welfare. There tends to be a focus on Architecture with a capital “A” where most of the recognition goes toward iconic buildings (important places where important things happen). But functional everyday “architecture”, for PEOPLE is where the true value of design lies. Our homes, offices, schools, libraries, civic centers, shops and restaurants, are such an integral part of our lives. How can we all engage in a collective conversation of what is missing and what is needed to make our communities better? "In order for Equity to become a reality, we need to go beyond just thinking differently. We can make a bigger difference by what we DO. Stay hungry for change, go grab your fork and join us at the table." There is also a great opportunity for collaboration between architects and the greater Philadelphia community as we prepare for the AIA National Convention 2016. So I encourage you to get involved and engaged to learn more about our next host city. The youtube video is now live! You can view the TEDxPhiladelphia talk here as well as the rest of the other speakers.